Ed Note: Today The Washington Post reports that a year-long military investigation, triggered by Aram Roston's story, below, finds “definitive evidence” that Pentagon contracting dollars have ended up in Taliban hands. On October 29, 2001, while the Taliban's rule over Afghanistan was under assault, the regime's ambassador in Islamabad gave a chaotic press conference in front of several dozen reporters sitting on the grass. On the Taliban diplomat's right sat his interpreter, Ahmad Rateb Popal, a man with an imposing presence. Like the ambassador, Popal wore a black turban, and he had a huge bushy beard. He had a black patch over his right eye socket, a prosthetic left arm and a deformed right hand, the result of injuries from an explosives mishap during an old operation against the Soviets in Kabul. But Popal was more than just a former mujahedeen. In 1988, a year before the Soviets fled Afghanistan, Popal had been charged in the United States with conspiring to import more than a kilo of heroin. Court records show he was released from prison in 1997. Flash forward to 2009, and Afghanistan is ruled by Popal's cousin President Hamid Karzai. Popal has cut his huge beard down to a neatly trimmed one and has become an immensely wealthy businessman, along with his brother Rashid Popal, who in a separate case pleaded guilty to a heroin charge in 1996 in Brooklyn. The Popal brothers control the huge Watan Group in Afghanistan, a consortium engaged in telecommunications, logistics and, most important, security. Watan Risk Management, the Popals' private military arm, is one of the few dozen private security companies in Afghanistan. One of Watan's enterprises, key to the war effort, is protecting convoys of Afghan trucks heading from Kabul to Kandahar, carrying American supplies. Welcome to the wartime contracting bazaar in Afghanistan. It is a virtual carnival of improbable characters and shady connections, with former CIA officials and ex-military officers joining hands with former Taliban and mujahedeen to collect US government funds in the name of the war effort. In this grotesque carnival, the US military's contractors are forced to pay suspected insurgents to protect American supply routes. It is an accepted fact of the military logistics operation in Afghanistan that the US government funds the very forces American troops are fighting. And it is a deadly irony, because these funds add up to a huge amount of money for the Taliban. “It's a big part of their income,” one of the top Afghan government security officials told The Nation in an interview. In fact, US military officials in Kabul estimate that a minimum of 10 percent of the Pentagon's logistics contracts — hundreds of millions of dollars — consists of payments to insurgents. Understanding how this situation came to pass requires untangling two threads. The first is the insider dealing that determines who wins and who loses in Afghan business, and the second is the troubling mechanism by which “private security” ensures that the US supply convoys traveling these ancient trade routes aren't ambushed by insurgents. A good place to pick up the first thread is with a small firm awarded a US military logistics contract worth hundreds of millions of dollars: NCL Holdings. 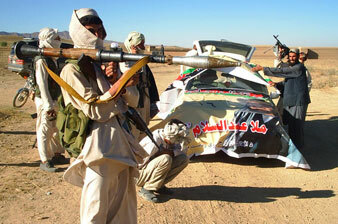 Like the Popals' Watan Risk, NCL is a licensed security company in Afghanistan. What NCL Holdings is most notorious for in Kabul contracting circles, though, is the identity of its chief principal, Hamed Wardak. He is the young American son of Afghanistan's current defense minister, Gen. Abdul Rahim Wardak, who was a leader of the mujahedeen against the Soviets. Hamed Wardak has plunged into business as well as policy. He was raised and schooled in the United States, graduating as valedictorian from Georgetown University in 1997. He earned a Rhodes scholarship and interned at the neoconservative think tank the American Enterprise Institute. That internship was to play an important role in his life, for it was at AEI that he forged alliances with some of the premier figures in American conservative foreign policy circles, such as the late Ambassador Jeane Kirkpatrick. Wardak incorporated NCL in the United States early in 2007, although the firm may have operated in Afghanistan before then. It made sense to set up shop in Washington, because of Wardak's connections there. On NCL's advisory board, for example, is Milton Bearden, a well-known former CIA officer. Bearden is an important voice on Afghanistan issues; in October he was a witness before the Senate Foreign Relations Committee, where Senator John Kerry, the chair, introduced him as “a legendary former CIA case officer and a clearheaded thinker and writer.” It is not every defense contracting company that has such an influential adviser. But the biggest deal that NCL got — the contract that brought it into Afghanistan's major leagues — was Host Nation Trucking. Earlier this year the firm, with no apparent trucking experience, was named one of the six companies that would handle the bulk of US trucking in Afghanistan, bringing supplies to the web of bases and remote outposts scattered across the country. At first the contract was large but not gargantuan. And then that suddenly changed, like an immense garden coming into bloom. Over the summer, citing the coming “surge” and a new doctrine, “Money as a Weapons System,” the US military expanded the contract 600 percent for NCL and the five other companies. The contract documentation warns of dire consequences if more is not spent: “service members will not get food, water, equipment, and ammunition they require.” Each of the military's six trucking contracts was bumped up to $360 million, or a total of nearly $2.2 billion. Put it in this perspective: this single two-year effort to hire Afghan trucks and truckers was worth 10 percent of the annual Afghan gross domestic product. NCL, the firm run by the defense minister's well-connected son, had struck pure contracting gold. Host Nation Trucking does indeed keep the US military efforts alive in Afghanistan. “We supply everything the army needs to survive here,” one American trucking executive told me. “We bring them their toilet paper, their water, their fuel, their guns, their vehicles.” The epicenter is Bagram Air Base, just an hour north of Kabul, from which virtually everything in Afghanistan is trucked to the outer reaches of what the Army calls “the Battlespace” — that is, the entire country. Parked near Entry Control Point 3, the trucks line up, shifting gears and sending up clouds of dust as they prepare for their various missions across the country. The real secret to trucking in Afghanistan is ensuring security on the perilous roads, controlled by warlords, tribal militias, insurgents and Taliban commanders. The American executive I talked to was fairly specific about it: “The Army is basically paying the Taliban not to shoot at them. It is Department of Defense money.” That is something everyone seems to agree on. Whereas in Iraq the private security industry has been dominated by US and global firms like Blackwater, operating as de facto arms of the US government, in Afghanistan there are lots of local players as well. As a result, the industry in Kabul is far more dog-eat-dog. “Every warlord has his security company,” is the way one executive explained it to me. In theory, private security companies in Kabul are heavily regulated, although the reality is different. Thirty-nine companies had licenses until September, when another dozen were granted licenses. Many licensed companies are politically connected: just as NCL is owned by the son of the defense minister and Watan Risk Management is run by President Karzai's cousins, the Asia Security Group is controlled by Hashmat Karzai, another relative of the president. The company has blocked off an entire street in the expensive Sherpur District. Another security firm is controlled by the parliamentary speaker's son, sources say. And so on. In the same way, the Afghan trucking industry, key to logistics operations, is often tied to important figures and tribal leaders. One major hauler in Afghanistan, Afghan International Trucking (AIT), paid $20,000 a month in kickbacks to a US Army contracting official, according to the official's plea agreement in US court in August. AIT is a very well-connected firm: it is run by the 25-year-old nephew of Gen. Baba Jan, a former Northern Alliance commander and later a Kabul police chief. In an interview, Baba Jan, a cheerful and charismatic leader, insisted he had nothing to do with his nephew's corporate enterprise. But the heart of the matter is that insurgents are getting paid for safe passage because there are few other ways to bring goods to the combat outposts and forward operating bases where soldiers need them. By definition, many outposts are situated in hostile terrain, in the southern parts of Afghanistan. The security firms don't really protect convoys of American military goods here, because they simply can't; they need the Taliban's cooperation. The rules are there for a good reason: to guard against devastating collateral damage by private security forces. Still, as Hanna of Afghan American Army Services points out, “An AK-47 versus a rocket-propelled grenade — you are going to lose!” That said, at least one of the Host Nation Trucking companies has tried to do battle instead of paying off insurgents and warlords. It is a US-owned firm called Four Horsemen International. Instead of providing payments, it has tried to fight off attackers. And it has paid the price in lives, with horrendous casualties. FHI, like many other firms, refused to talk publicly; but I've been told by insiders in the security industry that FHI's convoys are attacked on virtually every mission. For the most part, the security firms do as they must to survive. A veteran American manager in Afghanistan who has worked there as both a soldier and a private security contractor in the field told me, “What we are doing is paying warlords associated with the Taliban, because none of our security elements is able to deal with the threat.” He's an Army veteran with years of Special Forces experience, and he's not happy about what's being done. He says that at a minimum American military forces should try to learn more about who is getting paid off. Which leads us back to the case of Watan Risk, the firm run by Ahmad Rateb Popal and Rashid Popal, the Karzai family relatives and former drug dealers. Watan is known to control one key stretch of road that all the truckers use: the strategic route to Kandahar called Highway 1. Think of it as the road to the war — to the south and to the west. If the Army wants to get supplies down to Helmand, for example, the trucks must make their way through Kandahar. Watan Risk, according to seven different security and trucking company officials, is the sole provider of security along this route. The reason is simple: Watan is allied with the local warlord who controls the road. Watan's company website is quite impressive, and claims its personnel “are diligently screened to weed out all ex-militia members, supporters of the Taliban, or individuals with loyalty to warlords, drug barons, or any other group opposed to international support of the democratic process.” Whatever screening methods it uses, Watan's secret weapon to protect American supplies heading through Kandahar is a man named Commander Ruhullah. Said to be a handsome man in his 40s, Ruhullah has an oddly high-pitched voice. He wears traditional salwar kameez and a Rolex watch. He rarely, if ever, associates with Westerners. He commands a large group of irregular fighters with no known government affiliation, and his name, security officials tell me, inspires obedience or fear in villages along the road. It is a dangerous business, of course: until last spring Ruhullah had competition — a one-legged warlord named Commander Abdul Khaliq. He was killed in an ambush. Even NCL, the company owned by Hamed Wardak, pays. Two sources with direct knowledge tell me that NCL sends its portion of US logistics goods in Watan's and Ruhullah's convoys. Sources say NCL is billed $500,000 per month for Watan's services. To underline the point: NCL, operating on a $360 million contract from the US military, and owned by the Afghan defense minister's son, is paying millions per year from those funds to a company owned by President Karzai's cousins, for protection. Hamed Wardak wouldn't return my phone calls. Milt Bearden, the former CIA officer affiliated with the company, wouldn't speak with me either. There's nothing wrong with Bearden engaging in business in Afghanistan, but disclosure of his business interests might have been expected when testifying on US policy in Afghanistan and Pakistan. After all, NCL stands to make or lose hundreds of millions based on the whims of US policy-makers. I believed the general when he said he really didn't know what his son was up to. But cleaning up what look like insider deals may be easier than the next step: shutting down the money pipeline going from DoD contracts to potential insurgents. Two years ago, a top Afghan security official told me, Afghanistan's intelligence service, the National Directorate of Security, had alerted the American military to the problem. The NDS delivered what I'm told are “very detailed” reports to the Americans explaining how the Taliban are profiting from protecting convoys of US supplies. The Afghan intelligence service even offered a solution: what if the United States were to take the tens of millions paid to security contractors and instead set up a dedicated and professional convoy support unit to guard its logistics lines? The suggestion went nowhere. In any case, the main issue is not that the US military is turning a blind eye to the problem. Many officials acknowledge what is going on while also expressing a deep disquiet about the situation. The trouble is that — as with so much in Afghanistan — the United States doesn't seem to know how to fix it. Aram Roston is an Emmy Award-winning journalist and author who covers national security, crime, and corruption.